What dad (or mom maybe) wants to walk into a busy restroom carrying a super large, overstuffed, feminine diaper bag? The Skip Hop Pronto is the utility knife of diaper bags providing a great alternative. One thing is inevitable when you are traveling with kids: a major diaper mess. And since you are traveling, the diaper messes will be bigger and grosser and more of a pain to deal with than anything you could expect. This diaper changer has been with us every time we have headed out the door since month 1. This diapering accessory is sleek and small and gets the job done without having to schlep the whole house. This thing folds up small and typically goes inside a larger diaper bag so you can still pack half the kid’s room and extra clothing. It’s the escape pod of diaper bags that still docks at the mother ship. And really, who wants to bring along a big bag into a potentially grody bathroom. This thing is about as manly as you can get for diaper duty; it’s the modern briefcase of diaper changers. What exactly is this this thing you ask? Fold out diaper changing pad with a little head pad. That is it. A small diaper bag that can be tucked under you arm for changing the baby on the go. airplane lavatory without changing table. This involved a quick maneuver on the back of the toilet seat. Just make sure you know what you are doing, move quick, and get the job done. In such tight quarters, avoiding a pee stream would be impossible, so move fast. Our Skip Hop Pronto has made it out the door on any excursion where a diaper change is a possibility. One thing that I would like to see is a higher quality zipper for the wipe compartment. Otherwise this thing is well made and takes abuse as it should. For $30 and free shipping it easily makes our top 10 list. After a few months of use, the outside stitching was coming undone on one side. A quick email to Skip Hop and we mailed the item back and got a replacement a week or so later. While we did have to go over a week without the Skip Hop Pronto we appreciated the fast customer response. The ‘new’ changer has been with us for over 6 months and been on many major excursions and we have had no problems with the stitching or elsewhere. Like the other items (and advice) on our website, we could care less if you purchase this. If ours gets lost, destroyed, or stolen, we will be buying our own replacement pronto. It also fits under most strollers and has a convenient loop strap with a clasp that can fit over the handle of an umbrella stroller or around your wrist for when you don’t want to carry a larger diaper bag. It’s small and light enough to tote along when you are carrying baby in a backpack too – and even has a pocket on the outside for incidentals like a credit card, cash, keys, etc. We also love our Pronto. Amen on the airplane diaper changing! 1. you can separate the changing pad from the wipes/diaper compartments if you just need one or the other. 2. 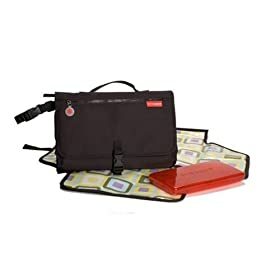 The awesome Skip Hop wipes case, which is SO much easier to use than any other wipes case on the planet, fits into the Pronto easily. It’s a must have baby shower present!